The largest of the gallery's three London sites, providing more than 5440 m2 (58,000 sq ft) of interior space on a site of 1.7 acres (74,300 sq ft). The building dates from the 1970s and was primarily used as a warehouse before the current refurbishment. White Cube Bermondsey was designed by Casper Mueller Kneer Architects who are based in London and Berlin. The building includes three principal exhibition spaces, substantial warehousing, private viewing rooms, an auditorium and a bookshop. 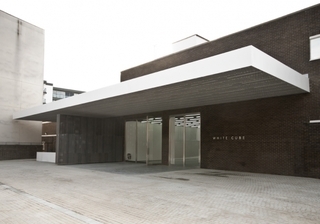 The 'South Galleries' provide the principal display area for White Cube's expanding programme of significant exhibitions. Three smaller galleries, collectively known as the 'North Galleries', feature an innovative new programme of exhibitions. In addition, at the centre of the building, there is a gallery of 81m2 entitled ‘9 x 9 x 9’. An auditorium will allow White Cube to present an education programme, artists’ films and lectures. 'Inside the White Cube' is a programme of exhibitions profiling work by artists who have not previously shown at the gallery. The series provides a stimulating platform for exploring new developments in international contemporary art, across a range of practices and media. Based at White Cube Bermondsey, the exhibitions are adaptable in content and, on occasion, migratory in location: from the north galleries, south galleries and auditorium to courtyard and external sites.